With the Noghalt update, there are 3 new character classes. 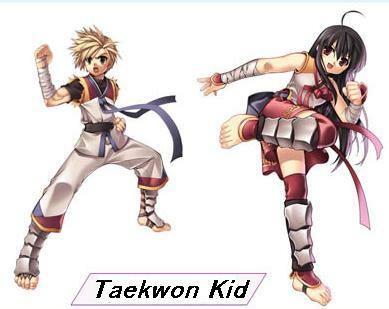 These are the first class Taekwon Kid, and the second classes Taekwon Master, and Soul Linker. All these new classes provide new and exciting ways to enjoy the Ragnarok Online world. The basic class, the Taekwon Kid is just like a regular first class, and switches from Novice. A Taekwon player can elect to become a Taekwon Master, a celestial warrior who gains his strength from the power from the celestial bodies, a Soul Linker, a mage like character who aids others by blessing them with new skills, or he can stay as a Taekwon Kid attempt to become one of the famed Taekwon Rankers. The second set of expanded classes, the Ninja and Gunslinger, are added in the future update, Episode 11: The Arunafeltz. Because of the nature of Expanded Classes, none of these classes are expected to be able to transcend in the future.